Yoga Accessories (TM) 8 Foot D-Ring Buckle Cotton Yoga Strap is an extra durable, easy-to-use yoga strap that has a little extra length, making it highly versatile and a great fit for any yogi. Extra thick at 1.5 inches wide, this strap provides maximum comfort and does not constrict circulation. 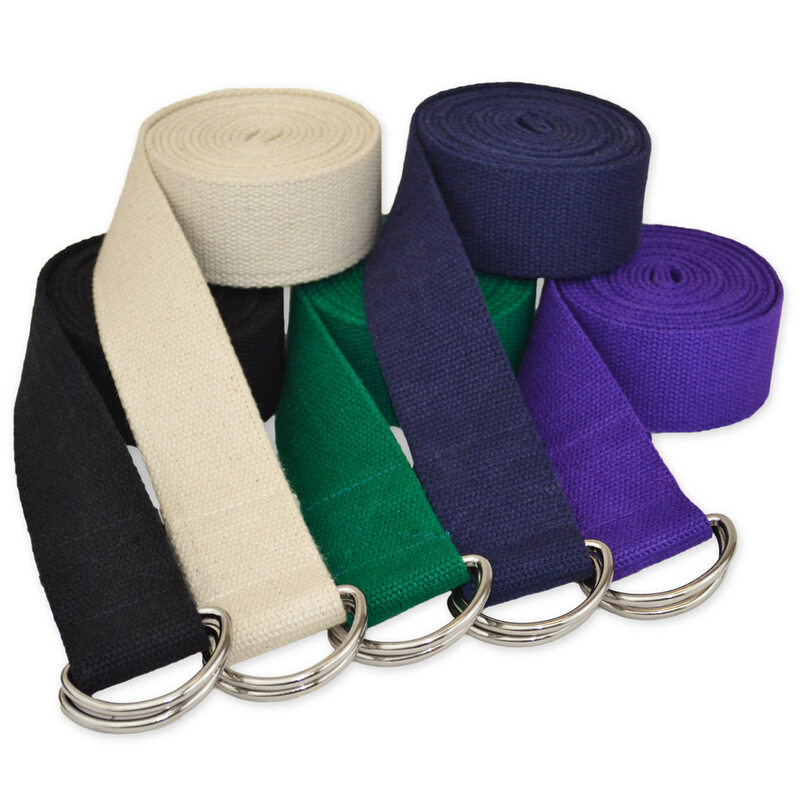 Our cotton straps are made from durable 100% cotton and are woven tight to keep them from slipping once buckled. The D-Ring design won't break, and makes adjusting your strap while holding poses easy. Yoga straps are an imperative tool for any yoga practice as they help achieve correct alignment and improve flexibility. Our generic yoga straps are also available in 6 or 10 feet long with your choice of d-ring, cinch buckle, pinch buckle, or even no closure at all (available only in 10' length). Great quality at a great price. We would have preferred more color options to match the color scheme we used with the bolsters and blocks, but no complaints re the quality or price. These are nice straps for the price. It will take time to soften the up, but with regular use the start will slide well trough the D-ring. Great strap. It does what it's supposed to do, seems sturdy, and looks how I expected it to look. Yoga on. I purchased these straps in black and am very pleased with them. They were delivered quickly and arrived exactly as they were shown on the site. The quality is excellent and they work for every class style we have at the studio. Will definitely be ordering these again as well as the 10' D ring straps. These straps are nice quality and just what I was expecting. I purchase two of these 8' straps for my husband and I. The length is excellent for him at 6'3" and I like the length as well. They are sturdy and the purple is a great color. I will be purchasing in bulk for my classes. Good quality strap at a good price. It works for the purpose intended.